Pioneer Locksmiths provide our commercial customers with the highest standards to meet their unique business requirements as well as industrial and safety regulations. Master key system - improves your managerial control and reduces the number of keys through the creation of a hierarchy of keys to access different areas of the business premises by rank or usage. Restricted key system - increases the level of security with restricted key barrels and controls illegal and unauthorized key duplication for unlawful usage. 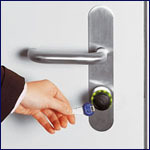 Access control system - allows flexible key-less entrance to your business premises in an assigned time log. CCTV - offers an affordable solution for preventing thefts or break-ins, or monitoring staff members. 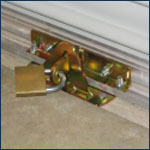 Door guard / protectors, security screen grill - enhances security of your back door and shop windows. 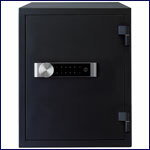 Fire-rated document safe, laptop safe, insurance certified safe etc. - protects your asset, as well as important data and documents. 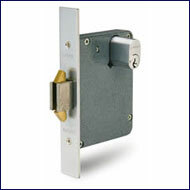 Heavy duty lock and door closer - offers a cost effective solution to your high traffic entrance. Heavy duty, weather proof and master keyed padlock - maximises protection to your containers, roller doors and gates. 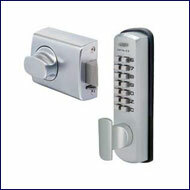 Fire rate door lock, driveway security mirror etc - allows you to comply with safety, insurance and council regulations. Key change for existing lock – provides "peace of mind" when moving into a new business premises, preventing illegal use of keys by ex-staff. 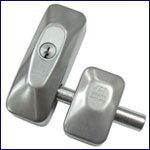 We Make keys to doors, garage doors, vehicles, filing cabinets or cash registers if you have lost the last key. We can assist your insurance claims for lost key, lock replacements or repairs. Lock out services– Pioneer Locksmiths will be there when you are in need so you can get back to business ASAP.